Haven't seen a thread for this yet but I figure it's time since most of the other brands have a thread! I know a lot of you have really nice Bianchis so feel free to post as many pictures of them as you want. Beautiful bike. while at the time I was glad my frame had a small crack so I could trade it for a MAX frame I really do mis my '88. Great thread, beautiful bikes! I need to take a decent picture of mine. Nice! Now this gives me a reason to snap a few new pics! I agree with BG, this is a great looking Bianchi. One of the few bikes that I've seen that looks real good with white striped sidewall tires. I have a couple of Bianchis, but only one is old enough for this forum. It's too small for me, but I still use it to tow my kid trailer around. I don't have a Bianchi to post up, but I do have a question that I'm hoping someone could answer. 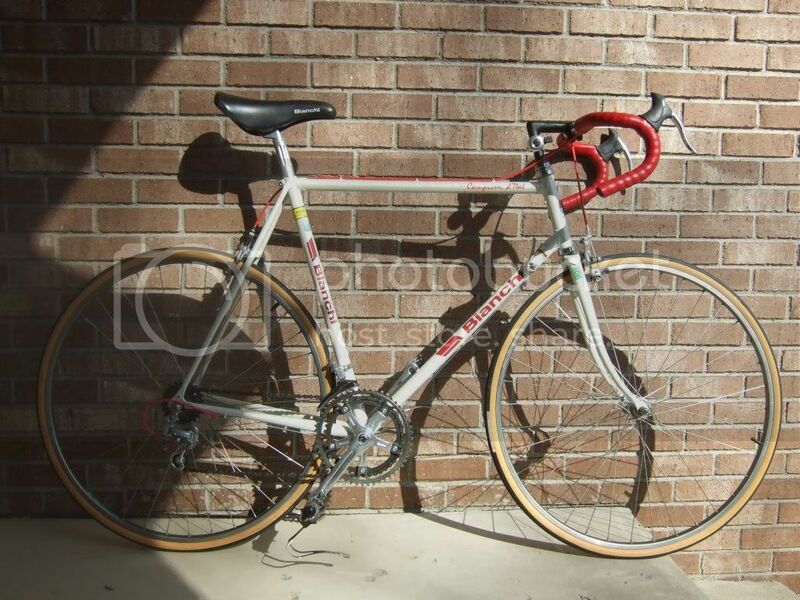 My first new bike that I ever purchased was a Bianchi in the late 70's. I was just out of high school and bought a lower-end model. This was when I think they had the Bianchi green as just one of their colors you could pick. It definitely wasn't a team color. My bike happen to be a beautiful metal flake gold with chrome lugs. It had lowerend Campy parts on it and was made in Italy. The bike lasted less than 48 hrs. Someone stole it! Anyways I have never been able to track down the reference of this bike over the years. I just wanted to see if the pics show as well as I remember the bike. It was an awesome color combination with some nice detail work for a lower end model. 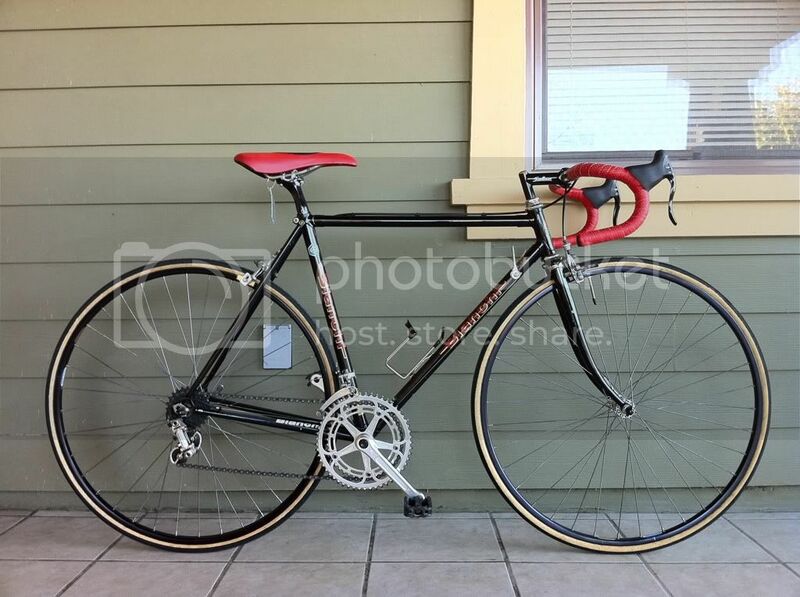 Any bianchi is welcome. Don't hold back bianchigirll! OK here is as I say "the Bianchi that started it all" after her recent restore/makeover. 1987 Sport SX. Tange frame/fork. Suntour Alpha 5000 drivetrain and brake calipers (DiaCompe), Shimano BB, Campi brake levers, QBP quill adaptor, Specialized stem and Nitto B115 bars. Sheetz XLarge Hazelnut coffee black with a little ice. the red on the seatstays is red reflective tape leftover from my commuting days. OH Sansin hubs with original Araya rim front and Ambrosio rear. Park bottle cages. Really nice! How do you ride on the hoods? The levers are WAY tilted up! Thanks to several people for kind comments on my favorite bike. The tires are Continental Grand Prix 4000's with a white reflective stripe. I thought the reflective stripe would be a good for commuting, and I think mix of black and white in the wheels plays well with the black bars and white hoods of the Campy brake levers. When I bought the bike it had a mix of Armadillo and Gatorskin tires. Switching the tires, changing the stem, and keeping everything else black, white or silver was all it took to bring out the classic beauty of the Celeste frame and gleaming alloy components. Some people like to have the bottom of their bars nearly level with the ground, which typically produces downwards sloping tops. Others like to have the tops of the bars nearly level with the ground all the way to the hoods, and the bottom of the bars angled so that they point towards the rear hub. I find the second set up much more comfortable for riding in either the tops, the ramps, the hoods, or the drops; probably because I no longer have the flexibility to lean as far forward as I used to!